The Professional plus is the same oven as the Professional Series pizza oven. The only differnce is the cart. The Professional Plus has the adjustable height cart / stand and 2 side preperation tables. One Flat Cooking Surface™. The ilFornino® Professional Series flooring is made from 1.5” thick refractory pizza stone, same flooring used in commercial ovens. ilFornino® Professional Plus Wood Fired Pizza Oven is ready to be& placed on the included adjustable height stainless steel cart / stand with casters for easy maneuverability. You can choose to set the height anywhere from 30" up to 42". Also the 2 side tables come in handy when counter space is limited. ilFornino® Wood Fired Pizza Oven is proudly assembled from local materials in Valley Cottage, New York. Height assembled from floor to top of chimeny anywhere from: 82.75" - 94.75"
Awesome oven, just what I was looking for. I am fully satisfied with the performance! I have cooked more than 30 pizzas, steaks, roasted chicken and some other deserts in ilFornino wood fired oven. All have come out excellent. I am fully satisfied with the performance. I've had my professional plus over a month. I've been extremely impressed by the build quality, and the ability to reach high temperatures. Yes, its as good as you want it to be! I had this oven from last 3 months and it completely changed my life. I can make tons of pizzas very quickly. Cooks a pizza in every 2-3 minutes. Crazy fast! Order the cover if you will use it outside. Go ahead and get a few pizza peels and one of those big rocking curved pizza cutters too. It's all working great and we get a lot of use out of it. Fantastic product, I am able to cook a pizza in 90 seconds or so. I just love it. Awesome customer support system whenever we have any questions related to the product. They shipped to Chile in few days. Pizzas are great. I highly recommend it. 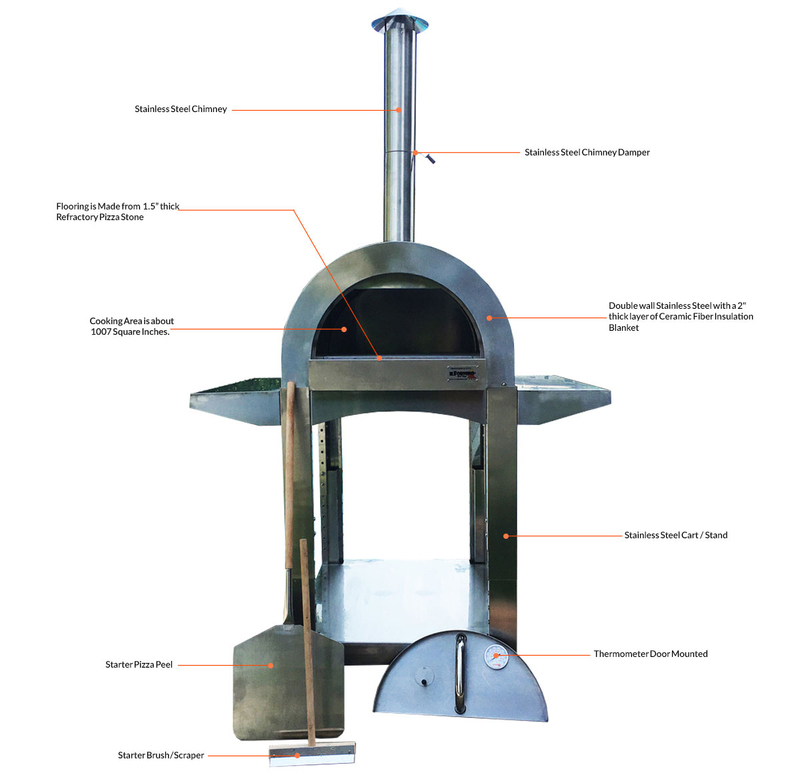 So I've researched the heck of out wood fired pizza ovens. I originally wanted to build a brick oven. I live in Maine and a stone mason quickly talked me out of it. I hemmed and hawed over this model and a different brand that was more expensive and boasted a more "quality" weld. Other than the weld I didn't see much of a difference it products. So onto the review... hit the buy button and it arrived 3 business days later. I had my wife help me transfer it from the driveway to the back yard. The oven itself was heavy but we managed to get it on the stand without issue. I was initially concerned about the cooking stones catching on the peel but the big stone takes up most of the surface area so not an issue. I started a fire with seasoned oak and it took about 20 minutes to get up to 500 degrees. After that it hovered around 500-600 degrees despite me playing with the air intake, damper, adding logs, etc. So after 40 minutes I decided just to push the fired to the side and begin cooking. No regrets after the first pie came out. It cooked quick! Like 30 seconds. Thinking the thermostat was off (should get an Infrared). The next four pies were amazing. After dinner my wife wanted to cook some chicken breast for a lunch salad the next day. We put them in a Dutch oven with marinade and placed it in the ilFornino. Ten minutes later... so good!! I'll post subsequent experiences as we go. Cooking in the oven is a lot of fun. After owning it for less than a week.. The oven arrived in about two weeks. It came in immaculate condition and was simple to put together. The only thing you need to know before you put it together is to get the base of the oven to the right height before you put the oven on top and to install the temporary handles to lift the oven on top of the cart. Everything else is a breeze. Cooking in the oven is a lot of fun. After owning it for less than a week I had a large party and cranked out 36 pizzas in less than two hours. I was cooking the pizzas faster than they were being made. The pizza oven is huge hit at our house and the pizza it creates is far better than any pizza made in town.